Back in the '60s and '70s a Citroen was a quirky and individual choice, but by the '90s under Peugeot's influence they'd become rather more mainstream. The latest DS models though mark a return to individuality. 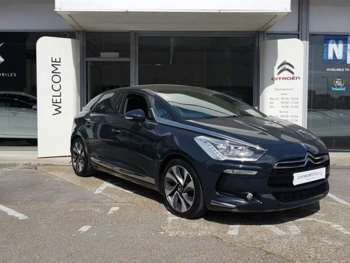 The DS5 is the executive version of the range and came along almost two years after its DS2 and DS4 cousins, not being launched until February 2012. It has a bold design with swoopy curves featuring a prominent grille and LED running lights with chrome highlights running back to the windscreen. The interior is similarly stylish with an aircraft-like overhead console and a head-up display that projects essential information in the driver's line of sight. There's a choice of four engines, the THP 200 petrol, e-HDi 110 and 160 diesels and the innovative 200bhp Hybrid4 diesel-electric hybrid. All are available with 6-speed manual, automatic or semi-automatic EGS gearboxes. The e-HDi 110 Airdream has a stop/go system to cut emissions and fuel consumption in traffic. 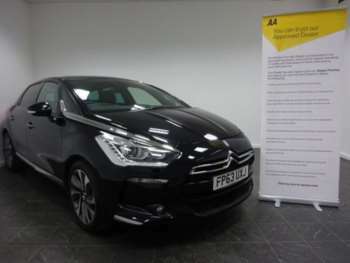 There are three levels of trim, DSign, DStyle and DSport, a DSport gives you sat-nav, an electrically adjusted driver's seat and full leather upholstery. Plus Sport Signature and Dark Sport Signature packs are available from July 2012 onwards that add different alloys and lowered suspension. These are standard on THP 200s but optional on the diesels. Also from July the e-HDi 115 Airdream EGS6 replaced the 110 version giving a slight power boost. The e-HDi 160 will do the 0-60 sprint in 8.5 seconds but you should still be able to manage 50mpg if you treat it gently. 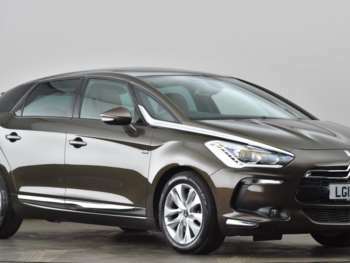 Stability control plus side and curtain airbags help the DS5 to a 5-star NCAP safety rating. These cars are still quite new so don't expect too many forecourt bargains just yet. 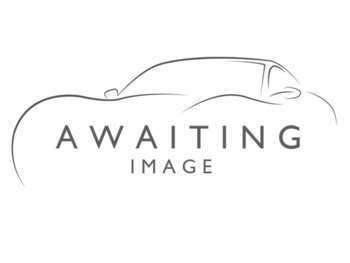 The earliest 2.0 HDi160 DStyle manual on a 12 plate with average mileage will set you back around £20,000. 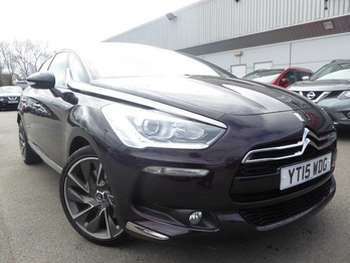 A DSport auto on a 62 plate with under 5,000 on the clock will be around £24,000. The Hybrid4 model is exempt from VED and from the London Congestion Charge. A 1.6 HDi 110 should be able to manage 50+ mpg. The cars haven't been around for long enough for any major problems to emerge. On big alloys and low profile tyres the ride can be harsh over poor surfaces and there is a good deal of tyre noise. Check that all of the clever interior electronics are working correctly and examine the front tyres for signs of hard use. 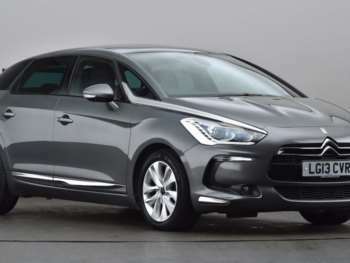 Again the Citroen DS5 for sale hasn't been on the market long enough to need major replacements outside of the warranty period. 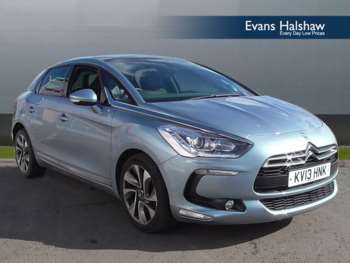 Citroen spares generally aren't that pricey with £12 for an air filer and £14 for an oil filter but items unique to this car – headlamp units for example – are likely to be expensive. The car rides and handles well, though steering can feel lifeless which discourages enthusiastic driving. 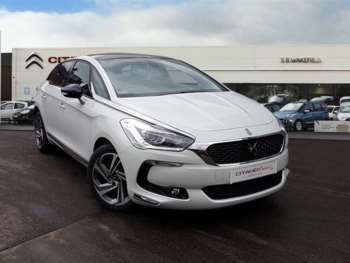 As noted above the ride can be harsh and noisy especially on larger alloys and this is somewhat at odds with the rather svelte image of the approved used Citroen DS5. Build quality is good though with the interior especially having high quality materials and feeling well screwed together. Diesels can feel a bit flat below 1,500rpm where the turbo kicks in. The hybrid is okay but the diesel engine seems to cut in a bit too soon to take over from the batteries and it's not really worth the £4,000 premium over the conventional diesel. In the real world the diesel won't be that far behind in the economy stakes either. It's worth noting too that this is a wide car – over six feet including mirrors – so it can be tricky to park and it may not fit all garages. There are some design niggles too, for example the car has no interior handle to close the boot so you get your hands dirty in bad weather. 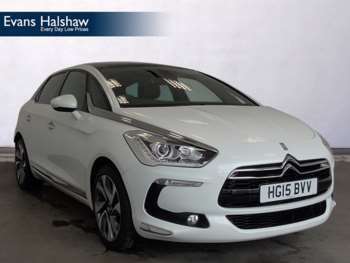 The used Citroen DS5 is undoubtedly different, with distinctive looks and some clever technology. For the most part the driving experience doesn't quite live up to the image but if you have a strong desire to be different then it makes an interesting used car choice that will certainly get the neighbours talking. 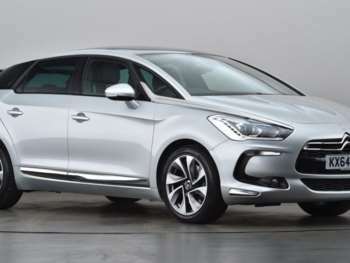 Got a specific Citroen DS5 model in mind?